Location: 403 Wilcox Street, Castle Rock Hours: Open for lunch and dinner; hours vary, visit website for details Price: Most entrees are available for between $8 and $15 Travel Time from Castle Pines: About 10 minutes Other Details: Take some time to look at the building – inside and out – it’s a little piece of history that’s close to home. 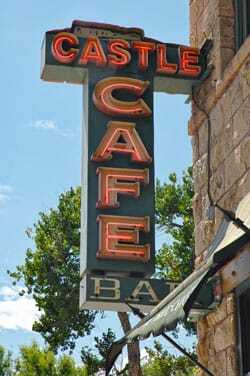 Before the turn of the last century, the Castle Hotel and Bar was a hot spot in the wild west town of Castle Rock. Area cowboys, quarry workers and ranchers would gather there, and things would often get out of hand – sometimes law enforcement would have to prevent inebriated bar patrons from riding horses through the bar. Now known as the Castle Cafe, things are decidedly more sedate at the downtown Castle Rock eatery, but the restaurant has retained enough of its Old West character to make it an interesting place to visit. And though the historic building and rustic décor make it feel like a different place in time, the food is a fun and modern take on comforting favorites. Castle Cafe has tasty down-home western favorites like burgers, green chili and brisket. It is widely known for its cooked-to-order pan-fried chicken, which is served family style during dinner service and includes all the trimmings – mashed potatoes and gravy, rolls, and a choice of slaw, soup or salad. Starters, which are called “table snacks” at the Castle Cafe, feature southwestern twists on old favorites like jalapeno onion rings and a loaded chicken quesadilla. Specials, which are not included on the regular menu, provide some pleasant surprises as well. On a recent visit, I enjoyed some blackened salmon tacos which had just enough spice to be interesting while providing delicious balance with the flavors of the fish and veggies in the tacos. I ate every last bite, and had I not been so full, I might have ordered some more. Castle Cafe is a great place to take the family, and a great children’s menu is available. For a more grown-up night on the town in Castle Rock, stop by The Next Door Bar after your meal. The casual atmosphere is a great place to kick back, relax, and enjoy the flavors of the Old West in a new and exciting way.